Exercise may be the best way to cope with this roller-coaster ride. Kids' bodies (and brains) change rapidly during puberty, which can quickly lead to feelings of awkwardness or more serious body image issues. What can help? Fitness. Regular physical activity may help tweens and teens feel more in control of their changing bodies. Exercise can also help kids in puberty manage stress and maintain their weight (even as their hormones compel them to add pounds). Even as they grow more mature and independent, your teens need you to keep talking to them about weight and health, so don't stop now. During puberty, boys may become more athletic thanks to added muscle and height. Even overweight boys may be inspired to exercise more, but obese boys may avoid physical activity due to embarrassment about their size. Boys this age may feel pressure to get "big" and muscular. And that can lead to dangerous muscle-building behaviors. A study of a large group of teens, published in the journal Pediatrics, reported that certain muscle-enhancing behaviors by teens may be on the rise, particularly among groups like athletes and kids who are overweight. The researchers studied nearly 2,800 adolescents (both boys and girls) from 20 different middle schools and high schools. They found five different ways that kids this age try to build muscle. Two of the behaviors are potentially healthy: changed eating and exercise habits. Three are considered unhealthy: overuse of protein and use of steroids or other muscle-building substances. Almost 12% of the teen boys, many of whom were athletes, said that they did three or more of these things. The authors of this study suggest that the way our society focuses on leanness and muscularity means that teens are engaging in these behaviors to boost satisfaction with their bodies (not necessarily for good health). So parents and doctors need to counsel teens on what's healthy, and what's not when it comes to building muscle and losing fat. It's no surprise that puberty can be a trying time for girls. Those who develop early may feel ashamed of their new curves and status as sexual beings. Those who develop later than their peers feel left behind. Weight gain associated with puberty is normal, but can leave girls worrying, "Am I fat?" 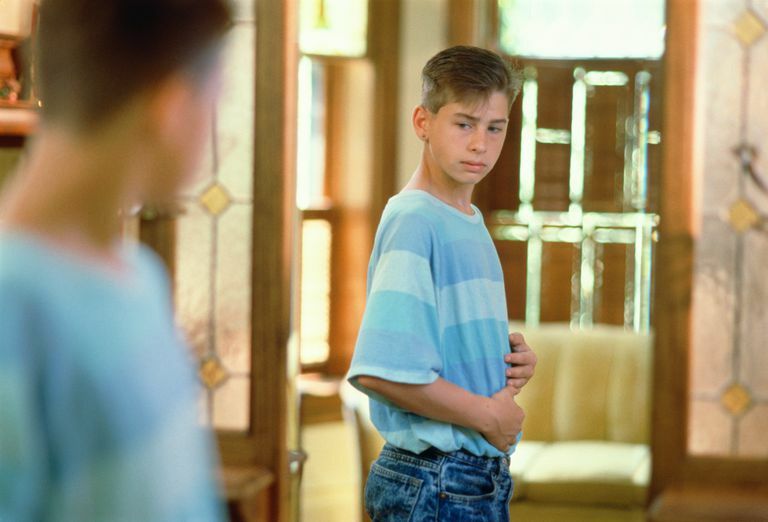 Poor body image can put them at risk for eating disorders (boys, too). Girls in the study on muscle-enhancing behaviors were very likely to change their eating and exercise habits during adolescence. Of course, this can be a very good thing, if done right! So keep talking with your daughter about healthy choices. Not every tween or teen likes sports, and that's OK. Team sports and competition certainly aren't for everyone, and you don't want to add extra pressure to your teen's plate. What is important is physical activity, in whatever form works best for your child. It prevents stress, in addition to promoting good health. So help her find some kind of physical activity she does enjoy. Maybe you can even participate in a sport together, or learn something new as a team! Eisenberg ME, Wall M, and Neumark-Sztainer, D. Muscle-enhancing behaviors among adolescent girls and boys. Pediatrics, Vol. 130 No. 6, December 2012. What Does It Mean That Your Child's a Tween?